Mastering the work-life dynamic presents unique challenges to everyone, but none more so than those whose passion can take them to the top. Taking a breather from a mid-week training session in a rundown Seagrave Park on Dublin’s northside, Kieran Kelly stops for a chat. After taking a seat on the bench beside me, he mixes a protein solution into his sports bottle using his finger, gives it a shake and signals to his coach in the distance that time’s up for this afternoon. The park is a convenient and quiet place to run. During lunch breaks he can avoid the morning rush of schoolchildren traipsing through on their way to the nearby comprehensive; midday dogwalkers and the elderly prove minor hinderances, but nothing that’ll break his stride. Loose tarmac bubbling up from the pathway can present an injury hazard, but he’s run here so many times he could avoid it blindfolded. After speaking today, Kieran will hit the shower, don his shirt and tie and return to his desk. Like many of us he’s a pen pusher – someone who turns up for work five days a week, clocks in at nine and clocks out again at five. Like most of us, he applies for annual leave when he wants to take a day off. Unlike most of us, when Kieran takes a personal day he isn’t going to the dentist, looking after the kids or nursing a hangover, he’s putting his park training sessions to work on the national stage, competing against world-class athletes. Managing a small department in a mid-sized recruitment firm seems stressful in itself; but couple that with competing in high-grade international sporting competition and it’s hard to imagine having time to pencil in a weekly 5k, let alone train enough you can knock out a mile in a little over four minutes. Kieran thinks that the effort is worth the reward though, endeavouring to juggle twin careers, each with their own very different obligations and demands. He credits his coach Brian Corcoran and his club Raheny Shamrocks as primary factors in his success to date. “I found being in a club a great resource because you have the benefit of the coaching set-up, the facilities available, use of say our clubhouse and so on,” Kieran explains, joking that even though the clubhouse isn’t exactly state-of-the-art, it’s still vital to the wellbeing of his career and the club itself. Despite the inherent, obvious challenges tied to maintaining a steady full-time job and remaining competitive on the track, Kieran has managed to remain consistent, conjuring up impressive professional-standard performances on weekends and on occasional short periods of annual leave. Recent trips to compete at meets in Bucharest and Vienna meant he had to dip into his 20-day annual leave allotment. Among the competitors Kieran raced that day was famed United States international road runner Will Leer. The team finished fourth that day, a respectable placement and honourable enough to earn another call up the following year, when the team finished in the same position. Since competing for Ireland for the first time Kieran’s career has gathered pace. The last two years have seen him win as many national titles at 800 metres and 1,500 metres respectively. His 800-metre triumph saw him creep within a fraction of a second of achieving the European Championships qualifying time. “I was one third of a second off the qualifying time for the European standard last time. Frustratingly, I was one-third of a second off by the standard set by Athletics Ireland but in respect of the European standard generally I would have qualified, but those are the rules.” Every European federation sets their own qualifying times. If Kieran had been competing for one of the supposed minnows, it’s likely he would have had to pack his bags. It’s easy to forget that athletes are human too and that away from the bright lights of top-end soccer and rugby, most hold down regular jobs and still manage extraordinary training regimes. Just as Dublin football county panellists might nip off to Boston or Addis Ababa for a year or two, athletes in other disciplines have been known to take time off, whether it’s for personal reasons or they become disillusioned. Kieran opted for such a hiatus a few years back. If Kieran achieves his target and runs a mile in under four minutes next year, he will be the oldest person in the history of Irish athletics to do so for the first time. It’s difficult for most to imagine toiling for a 40-hour week and subjecting ourselves to the rigours of an athlete’s diet and six-day training regime on top. Swapping a cheeky few pints on a Saturday evening to train outdoor at the mercy of rough Irish winds and the prospect of walking home as wet as a carp doesn’t strike most as appealing. For those who put in the graft though, the rewards can be rich. Kieran is anticipating a bumper 2019 season, with the prospect of another Irish call-up a motivating factor. 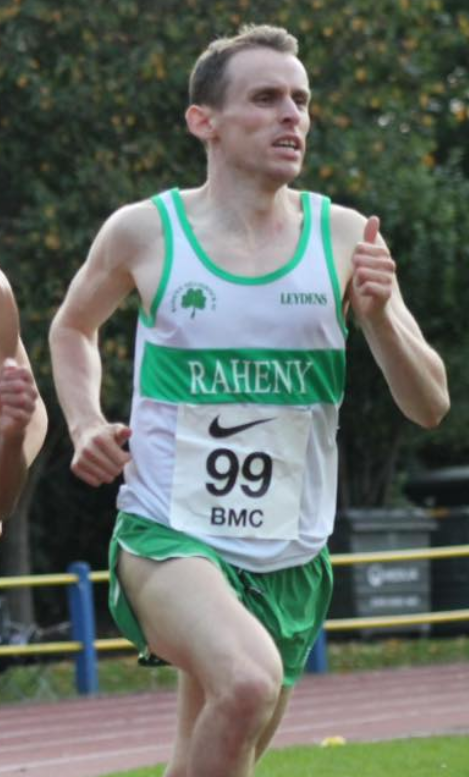 Ireland will field a 4×1 mile team in the European Championships next year after a first appearance for an Irish side in the event this year went pleasingly, and Kieran may be in with a shout of grabbing a spot. As of earlier this week, John Travers and Paul Robinson are due to represent Ireland but Kieran’s recent impressive times means he’s in with a shout of making the cut should a spot open up. These experiences make lunchtime runs in Seagrave Park worth their weight in gold. Article written and submitted by Patrick Reid. Previous Could Ireland’s Future Be Outside the European Union?